If your cat is microchipped, contact the microchip company and inform them. Produce some leaflets to put through local letterboxes asking neighbours to look in garages/sheds etc. in case your cat has become trapped in an outbuilding. 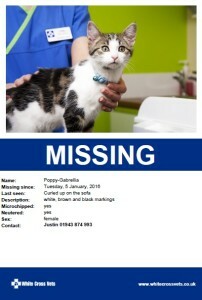 On the leaflet give your contact details (include a land line number as well as a mobile number and/or email address to encourage people to make contact), description of the cat and when they went missing. If you can include a photograph on the leaflet this is also helpful. Place copies of your leaflets on available notice boards such as local shops/post office/newsagents/vets etc. Also on your gate, in your front window or on a few local lamp posts. Let your postman/milkman/newspaper delivery/window cleaner know as they may be prepared to keep an eye out for your cat. Contact all your local vets to ask if anyone has reported a cat matching yours. They often have a lost and found book and will add details. You can also ask to place one of your leaflets on their notice board or in the surgery waiting room. You can place a LOST advert in the Derby Telegraph for a small fee. You can do this online at www.thisisderbyshire.co.uk, click on Place an Ad and choose the Notices section or by phoning 01332.411888. Many areas also have local papers that will carry lost notices. If possible, place a photo advertisement. Check your insurance policy, many cover the costs (to a certain amount) for advertising and providing a reward if your pet goes missing.